Polly is an award-winning writer and documentary-maker. Combining the journalism of her background in film with ideas from psychology, philosophy and literature, her books blend remarkable human stories with reflections on how we live today—and how we can live better. 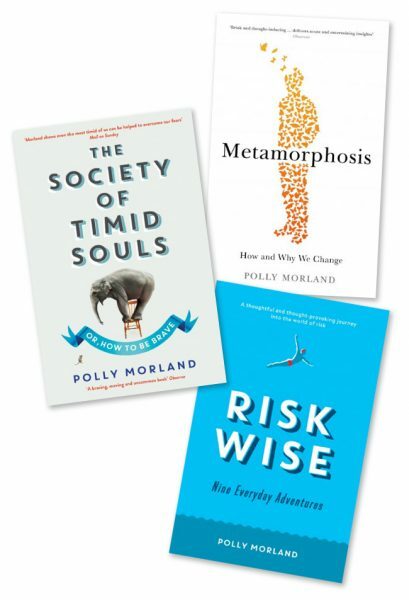 Polly’s first widely-acclaimed book The Society of Timid Souls, or How To Be Brave (2013) won a RSL/Jerwood Award, was longlisted for the Guardian First Book Award and was a Sunday Times Book of the Year. Risk Wise – Nine Everyday Adventures (2015) includes an afterword by Alain de Botton and was written in conjunction with The School of Life. Metamorphosis – How and Why We Change was published in hardback in 2016. The paperback, with a new preface reflecting on a year of seismic change, was published in May 2017. Gorgeously written, deeply felt, and sharply researched. This is one of the few books I know that leaves me literally grateful to the writer for doing the work they do. I loved it. A wonderfully wide-ranging study of the principle of inconstancy... Morland is a measured, ever-curious and approachable guide and she never takes the easy way out. Morland approaches her subject with energy, tenacious curiosity and courage ... a bracing, moving and uncommon book. A great project ... through the variety of interesting stories, we see the colour and sophistication of people's reasoning. Wonderful... it really is a brilliant book. Polly Morland's voice is warm yet very smart, and she's collected some cracking good stories.